The CoffeeShop Blog: CoffeeShop Photographer Storyboard: 8x10 Two Hearts! CoffeeShop Photographer Storyboard: 8x10 Two Hearts! Happy Friday!!! Today I have a really pretty photographer storyboard to share with you. CoffeeShop "Two Hearts"is 8x10 and has two heart frames. 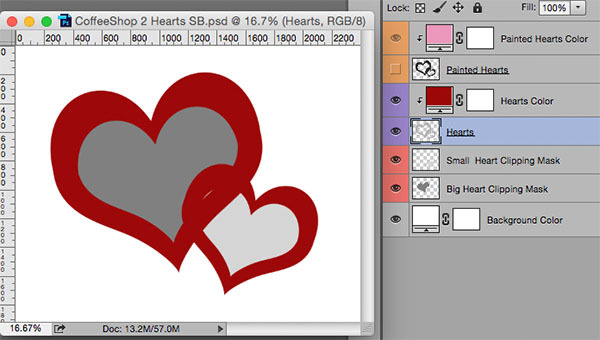 I made two versions of the heart frames, one solid color and the other looks like it is drawn in chalk. You can use these printed or on the web. 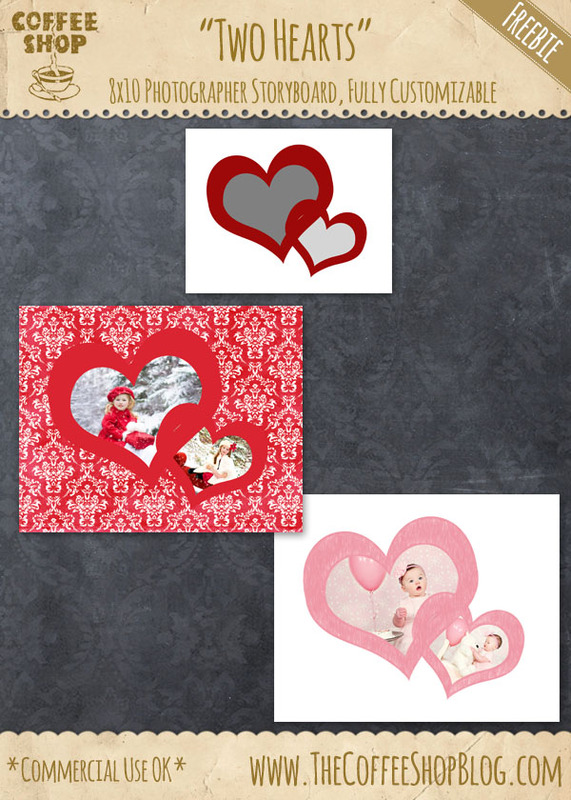 You can change the colors of the hearts and the storyboard background, or even add a pretty digital paper/texture behind the frames. I used some beautiful images from Jill Wellington (Etsy Shop, Facebook, Blog, YouTube Videos, Pixabay) on these examples. This is what the storyboard looks like when you first open it. Starting from the bottom you can change the Background color (or add a pretty digital paper/texture), then you have both the small and large heart clipping masks where you add your images (tutorial and free action), the two purple layers are the solid color heart frames (change the color to anything you like), and the top two orange layers are the painted heart frames. 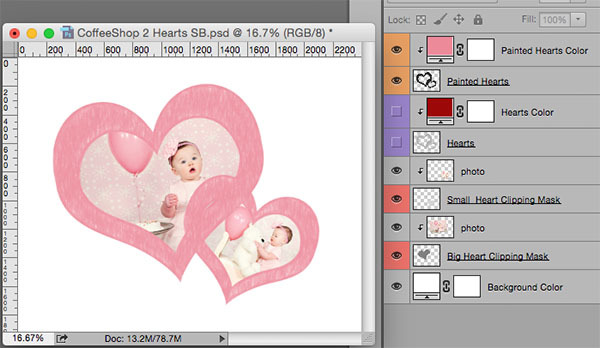 Add your images to the clipping masks and then turn on the two layers of either the Hearts or Painted Hearts and use the color fill layer to choose your heart frame color. I usually try to select a color from the images if possible. Here is an example of a finished storyboard. I turned on the top two orange layers to get the Painted Hearts frame and changed the color to match the balloons in the images. I think this is so sweet! Download the CoffeeShop "Two Hearts" Storyboard. You can also download it here.